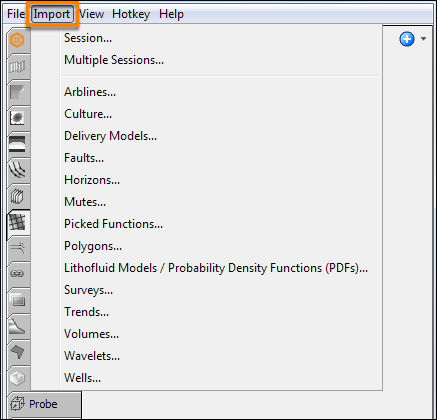 Items that are not in the project database can be imported into Insight. However, make sure the format of the items are supported by Insight. For a full list of formats accepted by Insight, see Formats accepted by Insight for import and export. Select the product type (i.e. horizon, well, fault, etc) that you wish to import. Browse and select the item(s), and click Open to add to the project. If you are importing a product saved in a text file, see below Text Importer. Note: Imported items will not be kept in the project until a session save has been made. Anything that you import into a project will be prompted to use the project's CRS. Insight allows you to import certain products saved in a text file format (.dat extension) using the Text Importer. In this example, we are importing a horizon (the UI might differ slightly with each product type). Most of the time, Insight does a good job of separating the columns in a text file by detecting certain delimiters. However, some files can be more complex and require you to manually configure how the columns are separated. This can be done in the Columns section. 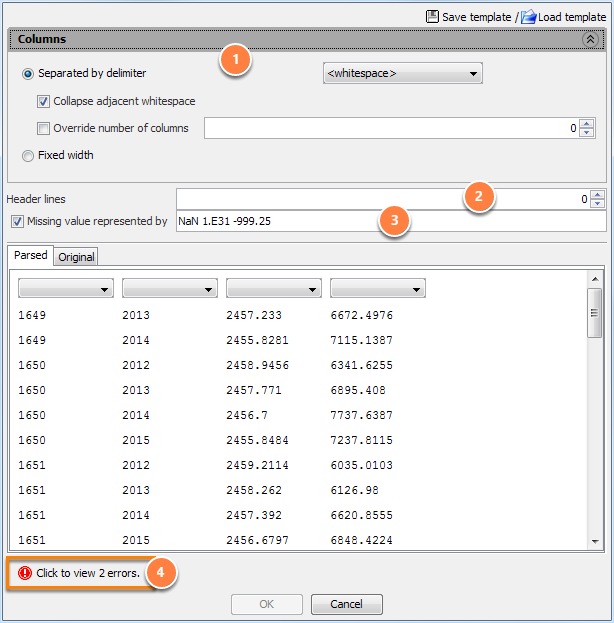 External datasets usually have header lines at the top of the file containing information related to the item. Those lines should be ignored when parsing the file. At Header lines, select the number of lines that should be ignored. Select the Missing value represented by check box to replace any missing values with a NaN. At the bottom of the text importer, click the exclamation icon to display the details of errors/warnings. 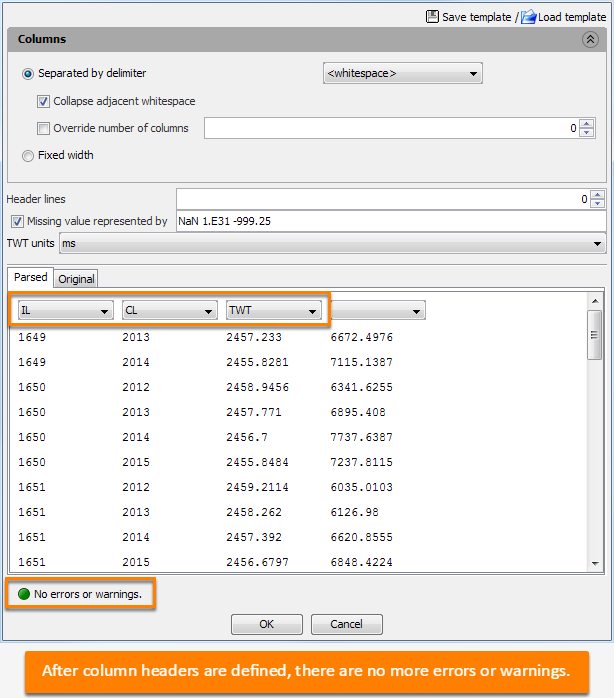 In this example, two errors are detected and you need to select the columns to import and specify a location dimension.